2. Only Bangladesh Railway Office determinate ‍application form can apply otherwise application will not accept. 1. Graduate degree in an reputation university. Every Interest legal candidate to http://www.railway.gov.bd/ or http://www.bdresultjob.com/ at download and print their application form. OnlyBangladesh Railway Office determinate ‍application form can apply otherwise application will not accept. 1. http://www.railway.gov.bd/ or http://www.bdresultjob.com/2017/09/bangladesh-railway-job-circular.html collect your application form download and print A4 size paper and It's fillup carefully all. 2. Passport size color photo 3 (Three) are attached Application and admit card designated place. 5. Applicant post name and Zila name must be written envelope left side. 6. freedom fighter Certificate attested copy submit. Written exam will be held for 100 Marks. Written test 60 marks and 40 marks are viva test. Individually 50% pass mark. Bangladesh Railway exam result visit official website www.railway.gov.bd. Also you can found update. Tags: Bangladesh Railway Application Form Download, www railway gov bd. www railway gov bd com. 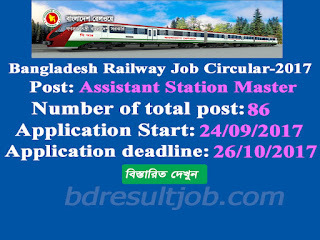 bangladesh railway job. bangladesh railway Assistant Station Master job circular 2017 chittagong. railway gov bd. 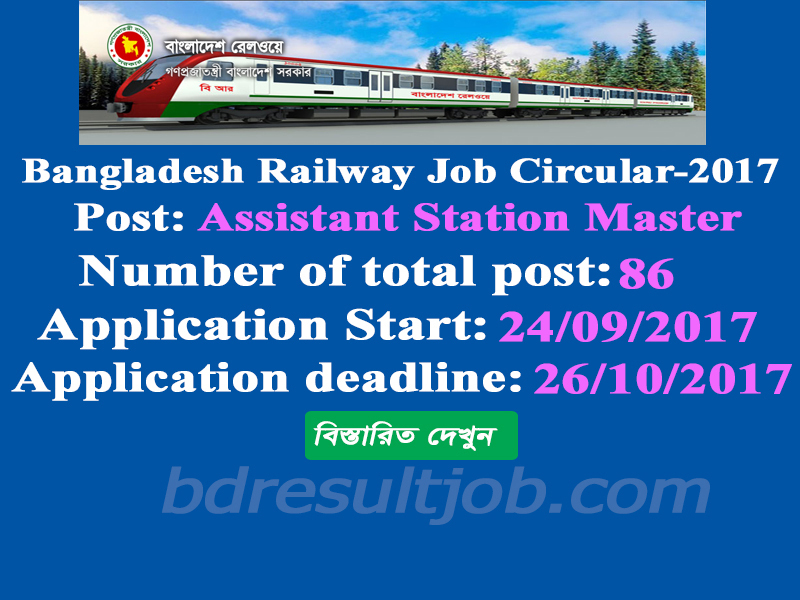 bangladesh railway Assistant Station Master job result 2017. Bangladesh railway Assistant Station Master result 2017. www railway gov bd result. www railway bd com. www railway gov bd 2017. bangladesh railway gate keeper. railway gate keeper result 2017. bangladesh railway job result. www railway gov bd /. www railway rajshahi com. bd railway gate keeper written exam date. www bangladesh railway gov bd. bangladesh railway CRB Chittagong job circular 2017. bangladesh railway CRB chittagong Assistant Station Master job result 2017. www railway gov com. bangladesh railway career opportunity, Bangladesh Railway job, BR assistant station master job, br employment notice, BR fourth class jobs circular, govt jobs br, jobs in Chittagong br, Railway Bangladesh Job Circular.